Everyone is welcome to to walk through our open doors and get a hot meal two times a day, every day of the year. Lunch is served from 11:30 am - 12:30 pm and dinner is served from 5:30 pm - 6:30 pm. 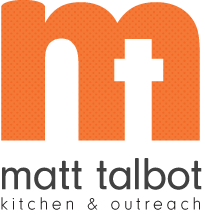 Annually Matt Talbot provides more than 100,000 meals to Lincoln's working poor and homeless. Food pantries are also available for those who do not have enough food at home. Outreach staff is available in the dining room during meal times to connect people to resources that take care of the whole person - providing beyond basic needs to embolden people to have hope.